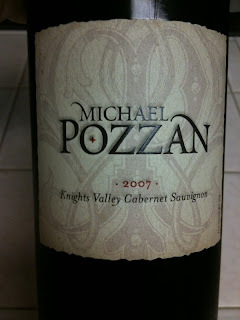 I've been seeing more and more of Michael Pozzan Winery products in the trades so in kicking off my review for the CSW exam with Bordeaux varietals I thought getting a bottle of the winery's Cabernet Sauvignon 2007 from the Knights Valley AVA (viticultural designation for a region in Sonoma) would be a fun time. Given this AVA is known for Bordeaux varietals (as well as a few Rhone varietals) I had pretty high expectations. The wine was clean, deep ruby-purple with a pretty broad core. The nose was clean, medium (+) intensity of blackberries and cassis with some nice earthiness undertones. So far so good... looks good, smells good. That leaves one more things, taste. The wine is dry, medium acidity and smooth tannins, very juicy in the mouth with some blackberry and what I swear is black cherry. What surprised me was the finish... the fruit seemed to go away pretty rapidly with the overall finish being pretty short (I would call it in WSET terms a medium (-) finish). Now don't get me wrong, this isn't a bad wine, far from it, but I was hoping for a little longer making out after the date.